This post refers to our playing card game 42. You can read the full rules for free here. Most of our Designer Diaries use the first person plural, but Kevin wrote this one in the first person because 42 was kind of his project. It was like this, only with more people and less awesome hats. ** Quick side note: When we say “traditional card games,” we mean the ancient stuff you find in Hoyle’s. 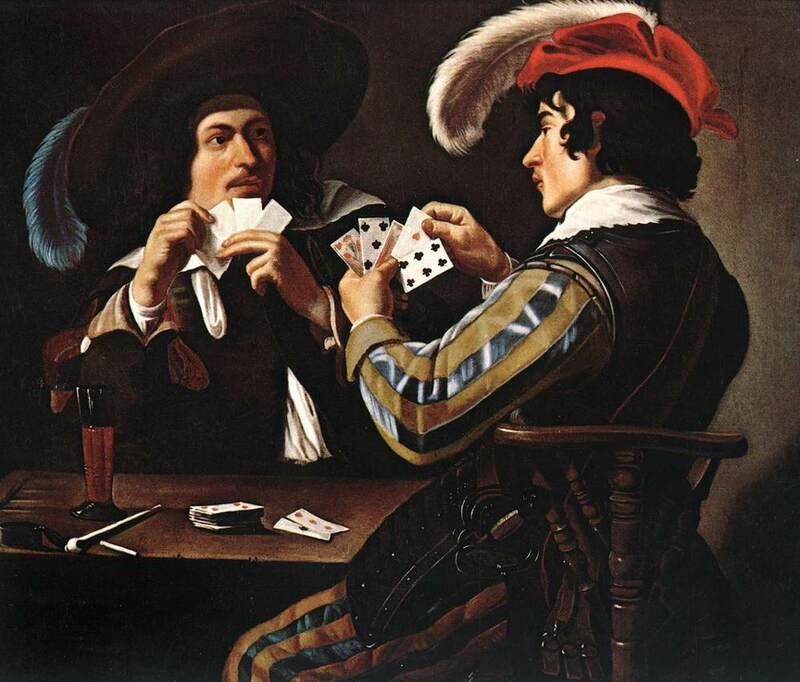 When we say “playing card games,” we mean any game that uses playing cards as its main component, including both traditional games and the ones on this blog. Any sufficiently good game will, if played with enough dedication, open itself up to you. Things that had previously seemed like weird quirks suddenly seem like genius design decisions. Things that once seemed like lucky or unlucky breaks now feel like the result of play skill. (In hindsight, I strongly suspect my pal’s “uncanny luck” was really an uncanny ability to maximize the value of strong hands.) Rules that had felt superfluous reveal themselves as necessary to keep the entire edifice standing. And you want that edifice to stand, because suddenly, it’s home. You feel powerful in this world, fluent in its language. When I first learned pitch as a kid, it seemed crazy to me, from the dominating power of trump to the arcane method of scoring “game.” When I heard about Jersey Pitch, it seemed even crazier. The five was worth five points? More than high, low, jack and game combined? How did that make any sense? Of course, as I played more, they all made perfect sense. I mention all this because 42 borrows a lot from Pitch, specifically Jersey Pitch played with partners. I started with a simple enough idea: What if there was a trick-taking game in which the trump suit could change? It made sense to make that a card power, and I knew I wanted it to be one of the lowest cards in the deck. Even though Pitch is a game that makes no concession to card balance — indeed, the existence of good and bad cards is integral to the game — the CCG fan in me will always like the idea of giving low-value cards strong special abilities. Plus, it would be easier to remember, say, the 2 and the 3 having special abilities (ah, because they’re the lowest cards!) than to remember a random number in the middle of the deck. All bow before the Black Lotus of Jersey Pitch. But I also knew I wanted something that approximated the 5-point five from Jersey Pitch. If you’ve never played Jersey Pitch, the idea is that you get points for capturing various cards. You get one point for the highest card of the trump suit, another for trump, and another for the low. And then there’s the five, which, all by it’s lonesome, is worth five points, more than the rest combined. This seems crazy, at first, but it also adds a critical amount of tension to the hand, shaping the entire thing around one dramatic event. One of the things I love most about trick-taking games is that they ask you to try to imagine how the hand is going to play out, and the existence of this one, crucial prize, really rewards you for doing that well. Even the seemingly random choice of the 5 makes sense. It has to be a low card for balance purposes, a card that cannot on its own win a trick unless played craftily. But it also has to be worth a lot of points, and making it worth points equal to its pips helps make it easy to remember and aesthetically pleasing. I decided to try making my trump-swapping card the same card as my “five.” That meant I couldn’t use the three–not enough pips. 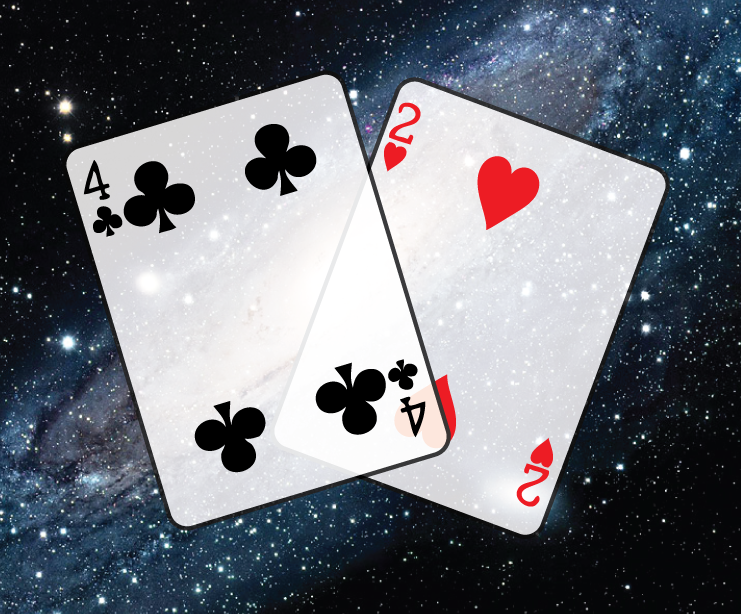 So I hit on the idea of calling the game “42″ — a Hitchhikers Guide to the Galaxy Reference — and making the 4 and the 2 the all-important cards. That brings us to the 2. What’s the purpose of the 2? Well, on a basic level, bringing a card out of your score pile seemed like one of the most obvious effects you could add to a trick-taking game, a way to involve a zone that was otherwise inert. 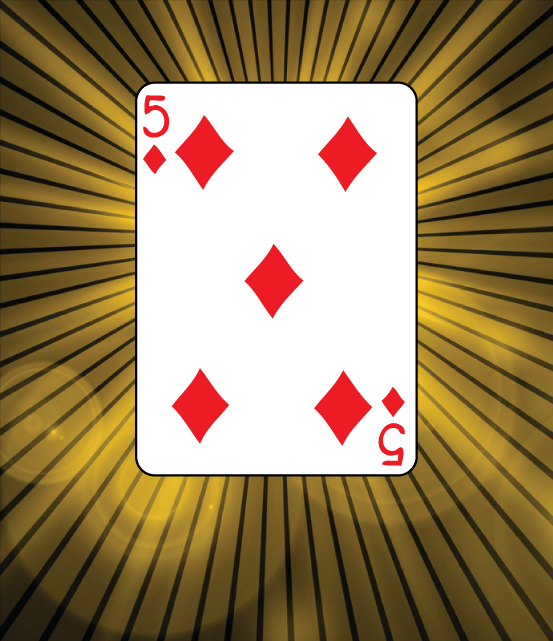 But the effect also interacts well with the effect of the 4, giving you a hope of bringing trump back around to where you’d like it to be, and making trump likely to change early and often — you’re a lot less likely to be miserly about throwing the 4 when you have a 2 in hand that can bring it back. I also like that it’s a trick your opponent can to some extent play around. While they don’t necessarily know if you have a 2, they do know what’s in your score pile, and therefore what range of cards a 2 might represent. As I said earlier, one of the key skills in trick-taking games is envisioning how a hand will play out a few tricks in advance, and the interplay between the 2 and 4 really puts a unique spin on that, making it both more challenging to do, and more rewarding when you pull it off. Get it? It’s called 42, and the most important cards are the 4 and the… okay, okay, so it’s not that clever. 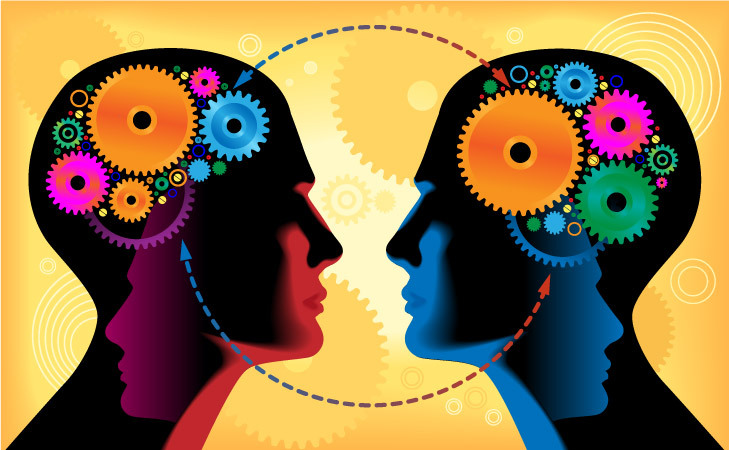 The 2 also has one last effect, which is to create a practical difference between your score pile and your partner’s. Occasionally you will even see players one-up their partner on a trick their team is already winning, because they know it’s crucial that they have a specific card in their score pile for later. It doesn’t come up too often, but I love moments in games where players realize that seemingly counter-intuitive plays are correct, and feel clever about it. This is our idea of a good time. That also brings me to the last aspect of 42 that I’m especially proud of, which is the opening card-swap. One of my favorite aspects of Pitch was the relationship between partners, the nervous hope that the other guy would bail you out, that they knew what they were doing, or were thinking what you were thinking. The moments when you were indeed serendipitously on the same page were always excellent, and I wanted to come up with a mechanic that could play up this dynamic. well in any trick-taking game, it’s absolutely crucial in 42, because it lets you attempt to plan for and psychically coordinate the swingy effects the 4 and 2 can produce. We’re now more than a thousand words in, and we haven’t even touched on the scoring or bidding systems. If people are interested in hearing more about them, let us know, and we’ll do up another post on them, or maybe on scoring systems in general. But my guess is that, after enough games, they’ll make perfect sense to you. That’s what happens when you settle in with a good game.